Connected learning is, in short, an opportunity for churches to more deeply engage with their communities and invest in local young people. It is also a movement that acknowledges a truth churches have always known: that learning happens everywhere. In communities across the country, especially in self-identified Cities of Learning, educators and other local leaders are finding ways to nurture and coordinate this learning, formal and informal. 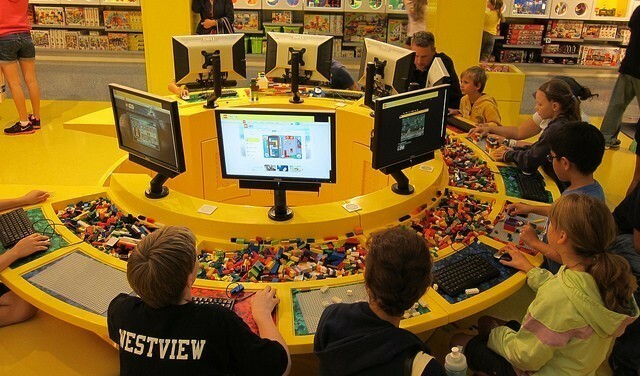 Connected learning partners include schools, libraries, museums, scouting groups, Boys and Girls Clubs, and—our perennial favorite in the faith formation world—households. My friend and colleague Lisa Brown and I just attended a gathering of connected learning practitioners in Pittsburgh. 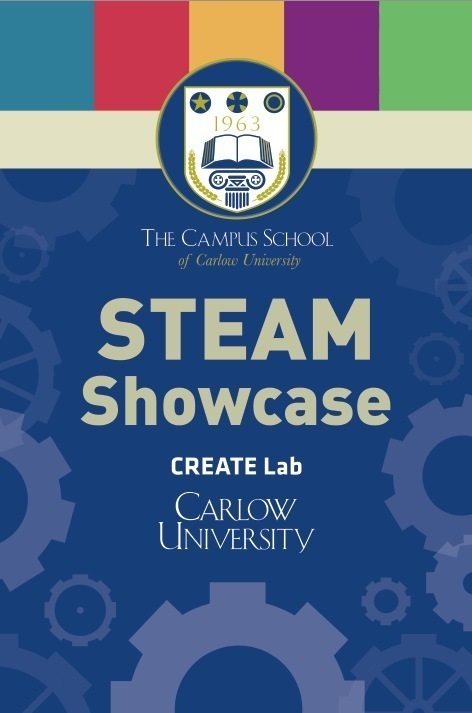 It was sponsored by one of the major funders of connected learning initiatives in that region and hosted by Carnegie Mellon’s CREATE Lab. We came away with the strong conviction that congregations have a role to play in the connected learning ecosystems emerging all over the country. But clearly it hadn’t occurred to most of the teachers and nonprofit leaders we met that they might reach out to churches for space to host connected learning programs or to partner in designing and offering them. Finding the right partners and building sustainable collaborations in this emerging movement is not easy. And the religious dimension, including fear of young learners being proselytized, may make it particularly difficult to build trust around faith-based involvement in connected learning. Poor church websites and IT infrastructure make it difficult to discover and promote programs at churches, and to host learning that takes advantage of Internet connectivity or other specialized tools. Although churches have much to offer such partnerships—we are experienced event planners, savvy designers of age-appropriate learning experiences, and supporters and practitioners of the visual and performing arts—our interest and skill is probably not well-known to those coordinating connected learning initiatives. (you knew it was coming) providing safe summer space and teaching the values of faith through summer camps and VBS. We hope as this movement gains momentum, these experienced partner-ers will help teach the rest of us best practices for getting connected. We know that most faith groups need to do a better job of translating their missions to secular audiences and finding common cause with others who work for justice and the betterment of our communities. I hope we will also reach out to the leadership of these increasingly sophisticated connected learning networks to learn about what they’re seeking: space needs, programming needs, leadership and volunteer needs. I hope we will be creative and flexible in thinking through what we have to offer. We can do so much to invest in our communities and get churches on their radars in the process. “Butts in pews” are not the point of this work, though we know engaged congregations often grow as a result of their community involvement. Helping transform our neighborhoods into places of vibrant and meaningful lifelong learning should be its own reward. And it fits perfectly into our mission—empowered as it is by the Spirit who leads us into all truth and connects us one to another. Kyle Matthew Oliver (@kmoliver) is digital missioner and learning lab coordinator in the Center for the Ministry of Teaching. Before seminary, he helped found a connected learning network called The Hacker Within for graduate students in Madison, WI. Photo credit: “Pick Your Play: Digital or Analog?” by Eugene Kim via Flickr (CC BY 2.0). What does tech fluency have to do with Christian formation? Guest post by Lisa Brown. The following post was initially written for an Episcopalian Christian educator’s blog but it I hope it would encourage anyone who wants to make the world a better place. I just spent two days at Context 2015: Tech Fluency for Teaching & Learning. The conference was sponsored by Carnegie Mellon University’s CREATE Lab, housed in the university’s Robots Institute. What could an Episcopal priest (e-Formation’s Kyle Oliver) and a Sunday school teacher (that’s me) possibly gain from this gathering of techies, scientists, and secular educators? What could we want with robotics? Circuitry? Digital imaging? Digital badges? Perhaps a hint that we weren’t completely out of our element was represented in the simple choice of venue for the event. In addition to the breakout sessions at the university—which is known for both letters and science—we gathered for each morning’s keynote address in the Carnegie Museum of Art. 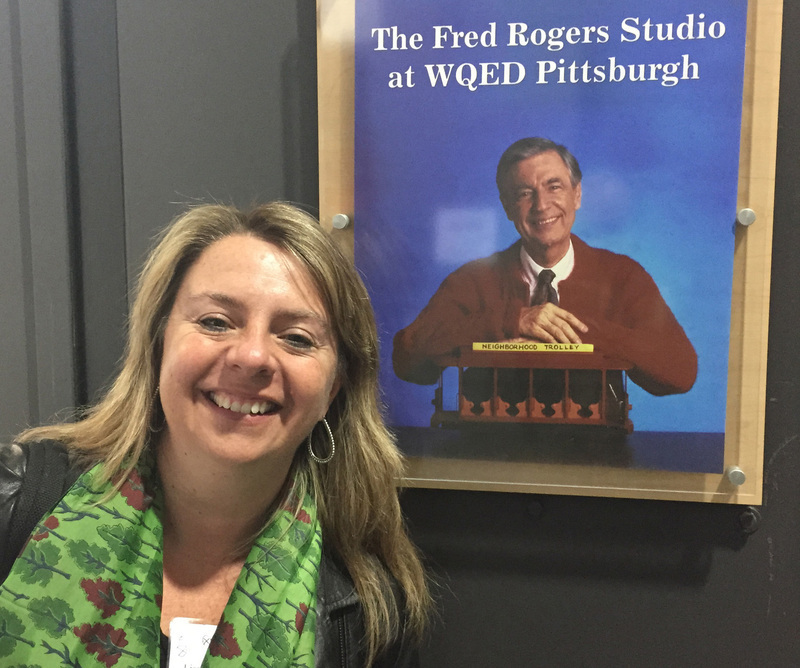 Best of all, we concluded our conference in WQED studios, where the perennial children’s classic television show Mr. Rodger’s Neighborhood was filmed. In addition to being a beloved presence in the lives of millions of children, Fred Rogers was an ordained Presbyterian minister whose message of unconditional love is embodied by Christian formation ministers everywhere. His theology was expressed in his profound respect for children’s curiosity, their worldview, and their need to explore. This gentle outlook served budding philosophers and scientists equally well. As an incredible example of the intersection of humanities and science, we learned about one of the “Arts & Bots” projects in which students created motorized shoebox dioramas based on poetry. In choosing which poetic image to represent, and by carefully constructing the diorama out of traditional craft materials brought to life by robotic components for motion, sound, and light, the students were encouraged to “go deeper” into the meaning of the poems they were studying. They were forced to consider the writer’s intention and context, as they reread and interpreted the words as a visual, animated image. In their personal response, they were forced to ask “I wonder?” questions. Wait a minute. That creative exegesis and questioning sounds a lot like Godly Play. In an illustration of technology being used to enhance historical understanding, we discovered the “100 Objects” project. Based on a popular exhibit at the British Museum, “The History of the World in 100 Objects,” the instructor asked his students to narrate a history of race in the U.S. The students chose the objects, and then recorded audio podcasts telling a first-person narrative, a witness to history from the “perspective” of that object. Next, the students used graphic design software to create posters featuring the object and a scannable QR code. The posters were displayed where other students could use their smartphones to read the QR code and gain access to the podcast. In one example, we listened to a microphone from the Cotton Club talk about being present in one of the first spaces where people of different races could mingle socially and witnessing the memorable day when Billie Holiday sang. Wait a minute. Educating young people about the history of race in America sounds like an effort to transform unjust structures of society. That’s one of the Five Marks of Mission in the Episcopal Church. Another fascinating demonstration introduced the “Bigshot” camera, the first digital camera designed for experiential learning. Children can assemble the entire device from a kit, and understand much of the underlying science with the help of some engaging online tutorials. 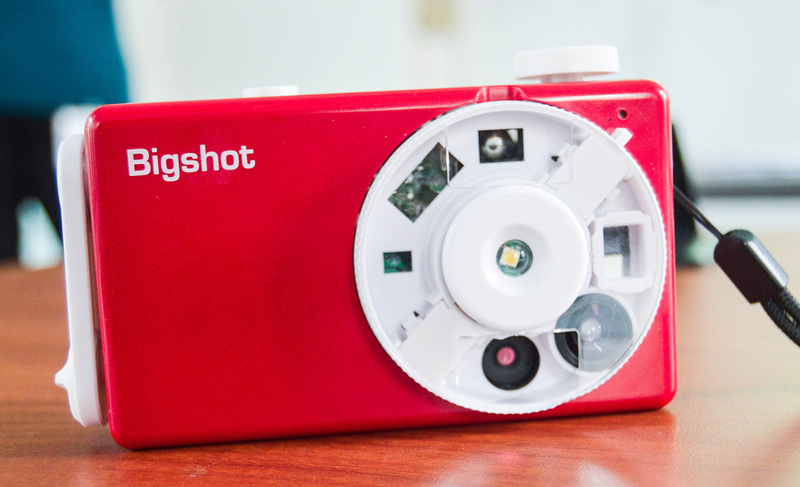 In one Bigshot learning project, immigrant children were each given a kit to assemble the digital camera, which is powered by a hand-crank and features a “Swiss Army”-style rotating lens. The children then took to the local art museum, where none had ever visited. They took photos there, had them printed (something most could not have afforded to do), and then got to see them exhibited at the museum with their families as special guests. To tell our story is a basic human urge; in fact, it is through storytelling that our shared identity is formed and propagated. For these mostly marginalized children, for whom English was a second language, and for whom economic and academic prospects were sadly limited, this camera gave them a voice with which to speak and be heard. It gave them a measure of dignity. At this point you may be asking if these examples are just gimmicks. Isn’t it a bit of a stunt to pitch technology education as Christian formation. I think not. Here’s an observation: in today’s world, if you give an 18-month-old child a spoon and an iPhone, you might be shocked to discover that they are equally adept with both tools. Technology provides us with tools. And tools are no more and no less than the means by which we accomplish something else. We build, we travel, we communicate using our tools. We share our faith using our tools. Before you could read the Bible on your Kindle, you read it in a book printed on a digital printer. Or an offset printer. Before the printing press, it would have been a hand-copied book written with a quill. Further back, before most people could read, we shared our stories and formed our community using stained glass windows and altar frescoes, crafted with hand tools and delicate brushes. We used the tools we had to tell our story. So today, when we have tools that are capable of miracles compared to their precursors, why wouldn’t we use them? This is how people communicate. This is how people form communities. This is how people interpret the world in which we live. To proclaim the Good News, to teach and nurture believers, we need to meet them where they are. We need to speak their language. It was with an almost theological orientation that Context Conference keynote speaker, former Carnegie Mellon provost Indira Nair, urged us to teach the next generation to use the marvelous tools available to us. The root of the word “technology,” she explained, was derived from the Greek word tekhne, meaning art, or craftsmanship, and logos, meaning expression. What tools will allow us to carry our faith into the next century and orient young believers? How can they help us to, as Nair challenged us, “invert the standard power relationship and privilege the child’s voice”? As Christian educators, these are the questions we need to be asking. Lisa Brown (@LCBrown67 ) is the Director of Children’s Ministry at St. Paul’s Episcopal Church in Pittsburgh, PA. She is also a coordinator for the Children’s Ministry Team of the Episcopal Diocese of Pittsburgh. A graduate of Carnegie Mellon, an active member of Forma, and a multi-troop Girl Scout leader, Lisa is passionate about creatively engaging, enlightening, and enriching the spiritual lives of young people. The Rev. Kyle Oliver is the Digital Missioner and Learning Lab Coordinator for the Center for the Ministry of Teaching at Virginia Theological Seminary. He is the coordinator of the E-formation Conference (http://www.eformationvts.org/ ) which is an ecumenical conference on ministry in a digital world. STEM Stars, a joint program between the Carnegie Science Center and the YWCA, targets middle school girls in Allegheny County. The goal of STEM Stars is to improve academic achievement and increase interest in and awareness of STEM topics and careers. What happens when you combine your creativity with computer programming? Craft and code your very own robotic creation using electronic components and recycled materials to amaze your friends and family. Each camper will take home the Hummingbird Basic Programming kit to power their robot. Daily fee includes lunch and snacks; before- and after-care available for $10/day. Sign up for 1-3 days or the week to fit your schedule & budget!. All campers receive a camp t-shirt! 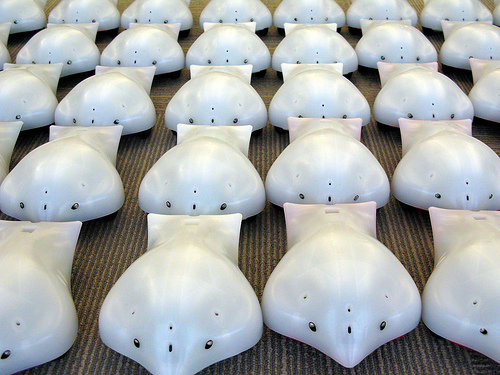 Arts & Bots class includes a take-home Hummingbird controller kit. We will only be offering one week of this super awesome session! We will be using the fantastic Hummingbird robotics kit to teach programming. This versatile platform was designed at Carnegie Melon’s CREATE lab. This week, The Aquatic Macoroinvertebrates Collection won the Engaging category of the national IXD Awards. The Interaction Design (IXD) Awards recognize and celebrate examples of excellence in Interaction Design across domains, channels, environments and cultures. The macroinvertebrates project leverages an emerging class of gigapixel image technology to make the process of learning to see and identify insects more visual and engaging, without sacrificing scientific detail. Accurately identifying stream insects is a vital aspect of tracking water quality and protecting the health of watersheds, but it requires developing observational skills and knowledge to be able to participate. The site enables a variety of learners to more fully engage and participate in monitoring, environmental decision-making, and activism around the protection and conservation of our freshwater water resources. Big congratulations to the entire Macroinvertebrates team! 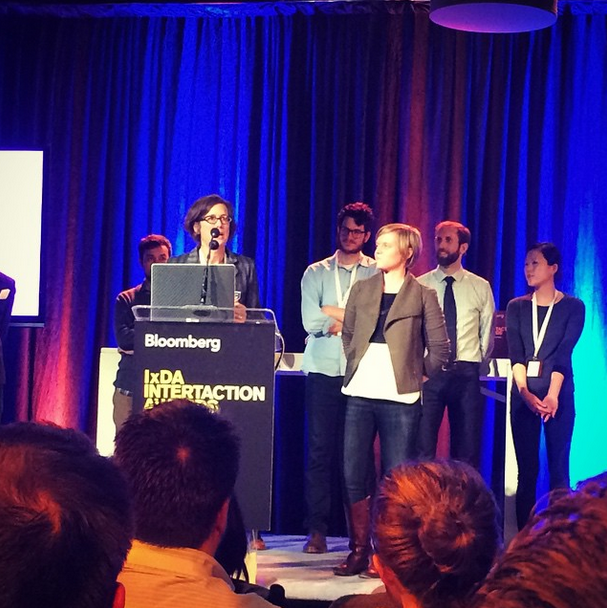 More info about the IXD Awards and the other entries can be found here. The projects on display in this showcase represent learning experiences constructed by our faculty to prepare students with 21st century skills. and the inspiration that results from the convergence of different disciplines. 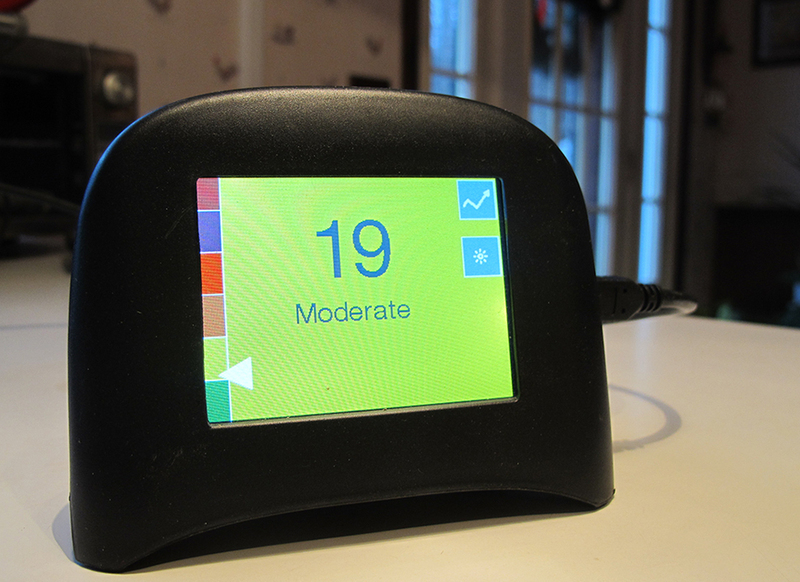 The Speck air quality monitor was mentioned in a recent article by NPR's StateImpact series. The article focuses on citizen scientists and the impact their data can have on scientific research and activism. Part of the article covered the Citizen Sense project from the University of London. As part of the project, researchers gave Speck monitors to people living near natural gas development in Pennsylvania's Susquehanna county. The main interest of the project is not the air quality readings but what the residents do with the data. Website for the project can be found here.